Whereas for a long time customer data was a rarity, this is no longer the case. This does not mean to say that it is any less precious – provided that it is reliable, traceable, and usable by the systems and teams managing marketing and customer relations. Adopting a Customer Master Data Management approach allows the digital era's enterprises to create a dynamic customer repository helping them meet the challenges of winning over, personalizing, and retaining customers. These last fifteen years have been marked by the phenomenal development of the global mobile and wired network that carries ever more intense voice and data traffic. Although this network gets forgotten most of the time, it fundamentally changes our way of life. In a world that has become digital, we are (inter)connected all the time, in all locations and at every moment. This is the case just through our mobile phones alone, which are increasingly smartphones: in 2015, these accounted for 86.2% of sales of mobiles – taking to 58% the proportion of French people equipped with one and therefore able to go online wherever they wish. For marketing and customer relations, this changes lots of things – in the 3rd quarter of 2015, purchases made on mobiles (m-Commerce) accounted for 24% of e-Commerce purchases, an increase of 26% as compared with the 1st quarter of 2015 - and so they now make it possible to interact with the consumer in a much more targeted way. In the months to come, and following major investment in the augmented reality sector, virtual reality headsets will offer even greater potential and be aimed at a wider public. They will emphasize even more the man-machine relationship in the digital age, stirring up new ethical problems linked in particular to privacy. We are plunged into a world connected in real time that has generated this deluge of data that we call "Big Data", corresponding to the almost limitless increase in digital traces caused by the combined explosion of the Web, social networks, and mobile. In this ultra-connected environment, the consumer is forever leaving traces, be they voluntary or involuntary, offering potentially precious indications for Digital, Marketing, and CRM departments that are ever more creative and interested in analyzing the preferences and behavior of users of the internet, social networks, and mobiles. Whilst these developments mark the end of the scarcity of customer data, they also force enterprises to equip themselves with new means for collecting, analyzing, using, and valorizing these masses of heterogenous data. As we well know, for the CRM to play its full role from now on, there has to be an approach incorporating the collection, processing, analysis, and valorization of all structured (internal to the enterprise) and unstructured (external) massive data. Only by intelligently cross-referencing all customer data is it possible to strengthen customer insight, segmentation, and personalization, the veritable holy grail of marketing and communication, serving the needs of consumers who are excessively solicited, increasingly demanding, and more and more difficult to convince and retain. Not so long ago, customer insight relied mainly on the analysis of data from internal systems. The compartmentalization of these systems most often prevented operational teams from having a single view of the customer or prospect. Today, digital marketing, predictive marketing, and omni-commerce feed on new data, collected in an "identified" way (at physical sales points and, after being authenticated, via digital channels), or in an "anonymous" way on the Web, thanks to the tracking of interactions with the brand or the analysis of social networks, allowing the profile and centers of interest of the potential customer to be identified. data on "contactability", in other words, the explicit agreement by the customer (by an opt-in) to receive the brand's offerings on the various channels (by post, telephone, e-mail or other ways). to comply with applicable legislation on the protection of privacy and data of a personal nature. all data, unitary and aggregated, relating to a customer must be accurate and valid at any given moment (the latest version in time of the piece of data, consolidated by taking the best from each system). 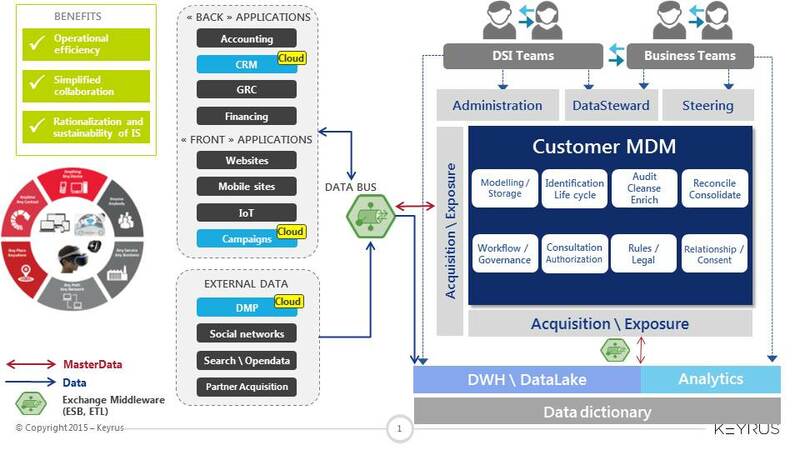 A Customer-MDM approach is aimed precisely at creating and maintaining this quality of data, by making available a method, a base, and functionalities for managing reference data that enable the enterprise to meet its customer relations challenges in a controlled way, and to do so as much in the physical world as in the digital sphere. ensure the overall governance of the quality of the data and manage the rights of their users/owners. Which data should be incorporated and what should they be used for? It is, of course, up to each enterprise to decide what its customer repository shall contain. The data can be extremely varied, but it is logical to begin with identification data (name, postal address, telephone number, e-mail address, IP address etc.) which make up the core of the customer file. Moreover, by cross-checking, they make it possible to connect an internet user (who is a priori anonymous) to a name and, as the case may be, to reconstruct households, since this can be a more relevant reference unit than the individual in the case of certain marketing strategies. Segmentation data provide a second level of information. These are aggregated indicators that, once uploaded into the MDM, can be shared and re-used in other applications and processes. For example, the customer's status (gold, platinum or other) in the loyalty program is of interest to marketing for targeting its campaigns, but also to the customer services department, which will use it to prioritize the processing of requests. More volatile, but also falling within this category, are the interest and engagement scores (deduced, for example, from data on how internet users navigate around the brand's website, or on the proportion of the e-mails for the latest campaigns which were opened by their recipients). Whilst there is no real limit on the data that can be incorporated into the customer repository, it is preferable to limit it to data that is of interest or use to departments/applications other than those that have produced the data. Contactability and consent data are also becoming crucial, given the tightening of privacy protection legislation and the growing reticence of consumers regarding solicitations to which they have not expressly consented. So as to protect itself in the event of a complaint, it is worth the enterprise keeping a record of the history of consents given for the relevant e-mail addresses. Through a long-term Customer-MDM approach, brands can give themselves a lasting competitve edge by their ability to capitalize on customer insight and use it to generate the engagement and support of today's consumers. These consumers are hyper-solicited and turn towards brands that know how to make themselves preferred. The ability to create this preference depends, for sure, on the reputation of the brand, but also, and increasingly, on the appropriateness of the experience that it offers the consumer – treated as a unique individual whom the brand can no longer strip down merely to their socio-professional category or purchasing history. More than ever, it is all about sending them messages/offerings that are appropriate at that given point in time. The only way to arrive at this level of appropriateness perceived by the customer is to link up data stemming from tracking, profiling, and analysis tools with standard identification and demographic data in order to implement hyper-personalization strategies. This is exactly what a Customer-MDM approach allows to be done, through the implementation of a dynamic customer repository.